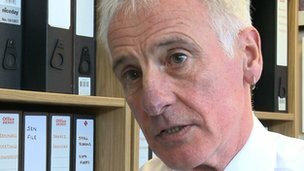 Growing concern about asbestos levels in schools has led to calls for routine testing for airborne fibres in classrooms in Wales. A BBC Wales investigation has found there is no acceptable safe limit for exposure to asbestos dust in schools. Campaigners have said airborne testing must be introduced. The Health and Safety Executive (HSE) says if asbestos is in a good condition and undisturbed it should not be a risk. BBC Wales' Week In Week Out programme carried out a survey of local authorities and found 1,514 schools in Wales - approximately 85% of the total - are said to contain asbestos. That is 10% higher than schools in England. Asbestos can cause a type of lung cancer known as mesothelioma, which can take up to 30 years to develop. Earlier this month, 900 pupils were moved out of Cwmcarn High School, in Caerphilly county, when contractors found asbestos dust in the air. The risk to pupils is said to have been low, but most of the school buildings have been closed and teaching is to be temporarily transferred to Ebbw Vale College at a cost of £1.5m. Nicola Young, who has two daughters at the school, said they first heard about the asbestos in September. "We knew there was asbestos in the school but we didn't think it was harmful and that the children would be affected in any way," she said. She still has concerns about her daughters' long-term health but said there is no immediate test that can be carried out. Education Minister Leighton Andrews has demanded that all schools deliver reports on their asbestos levels. He declined to share the information with Week In Week Out and said he was evaluating the results before deciding how to proceed. Robin Howie, an independent asbestos consultant and former government adviser, says that current monitoring of asbestos does not go far enough. Mr Howie, who believes all schools should undergo air testing, has examined the Cwmcarn situation where brown asbestos fibres were detected in parts of the school. He said: "The local council says the fibre levels were between 0.003 and 0.008 fibres per millilitre. "From those fibre levels we can look at the risks of those levels to 11 year olds over 5 years of developing mesothelioma. "The acceptable level of risk as defined by HSE is 1 per million per year that means the risk levels in the school from school's own figures is between 20 and 50 higher than the level of acceptable risk." Rex Phillips, the Wales organiser for the National Association of Schoolmasters and Union of Women Teachers (NASUWT), said monitoring for asbestos dust in schools needed to improve and air tests should be routine. "Clearly now the challenge for the minister is to decide what test he's going to use to determine whether the teaching environment is safe. That is what the Cwmcarn situation has done," Mr Phillips said. "They have raised the bar in this now and highlighted a problem which is in our schools and clearly the minister has to decide what the safe level going to be. " The official advice from the HSE is that if asbestos is in good condition and it is not disturbed, it should not pose a significant health risk. The HSE and Public Health Wales told the programme that while there were occupational limits for exposure to workers, there were no accepted safe levels in schools. They also said that routine air testing for asbestos is not carried out.